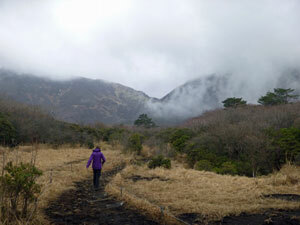 We had been lucky with the weather for our walk on the Takachiho Olle Course. 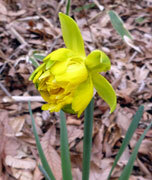 Today was much bleaker - cooler with a cover of grey cloud. Setting our car's GPS, we headed off into the mountainous terrain of central Kyushu(for those who might think we have suddenly become adept at Japanese characters, all you have to do is enter the telephone number of your destination and, voila, your course is set). The English-speaking GPS took us on the shortest route, more on by-way than highway, which proved an interesting way to get to Choja-baru. 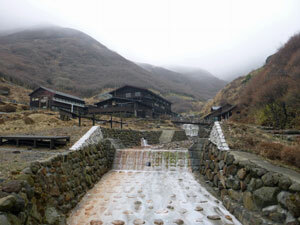 This small hot spring centre on the edge of the Kuju Mountains was our destination. 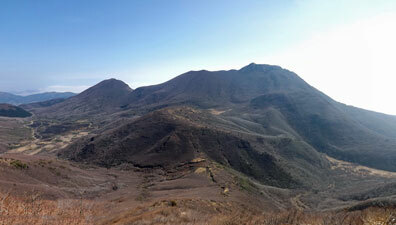 The Kuju Mountains comprise a massif of several volcanic peaks, and are the highest mountains on Kyushu - an invitation to the trekker, if ever there was one. 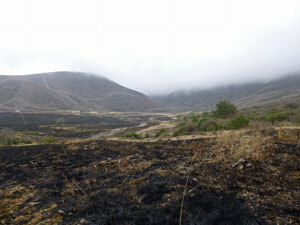 They are also part of the Aso-Kuju National Park and there is an excellent interpretation centre at Choja-baru. As we had arrived in the early afternoon, we visited the centre and did a short walk along the boardwalks and paths of the Tadewara marshlands, a RAMSAR-protected wetland. 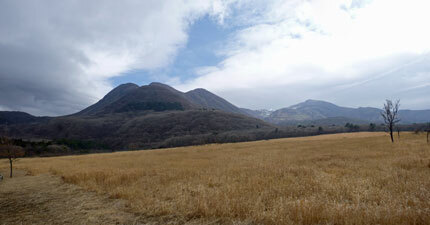 Dry at the moment, one could imagine what they would look like during the summer wet season. 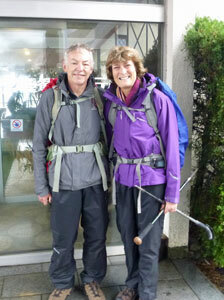 Then it was back to our hotel to prepare for our two-day hike into the heartland of the Kuju Mountains. The forecast was not looking good. It had rained all night long and was still raining when we woke - the only difference was that now the whole valley was covered with a dense fog. 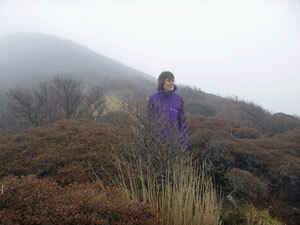 It did not seem propitious weather for a mountain hike, so we sat in our room watching the fog drift in, clear a bit and drift back in, as showers passed by. Our designated departure time of 9am came and went with no change. 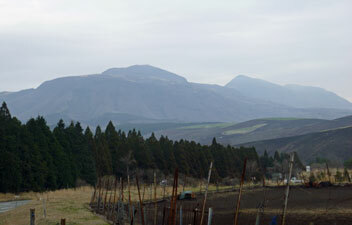 At 10am, we bit the bullet, donned full wet-weather gear and set out into the foggy drizzle - after all, we only really needed to get up to the Hokke-in Mountain Hut two and a half hours away. Any walking beyond that today would be a bonus. 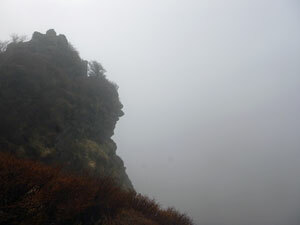 Within 10 minutes of setting out from our hotel to stroll down the footpath that led to the National Park Visitors Centre, the rain had stopped and the fog began to lift. 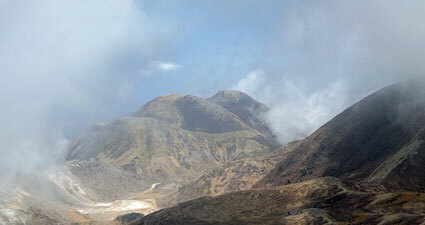 By the time we reached the Visitors Centre, there was even a touch of blue sky and visibility was good enough to see our route ahead, up and over a saddle. 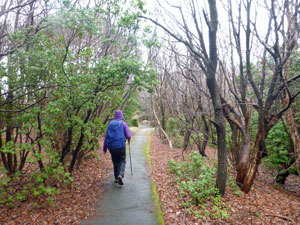 We stripped off our wet weather gear and set off across the boardwalk over the grassy flats of Tadewara Wetlands. 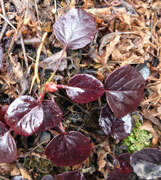 On reaching a sign-posted junction on the far side, we turned south to head a up a broad trail beneath the canopy of a deciduous woodland - desolate in its leafless winter garb, with the first buds of spring just beginning to green up. 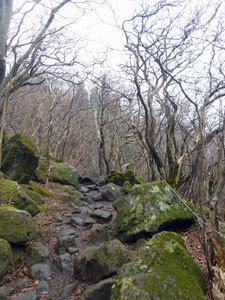 The track then began to climb up a footpath lined with mossy rocks and boulders. In this still air the humidity was saturating even though the temperature was in the low teens, and our shirts were soon damp with perspiration. 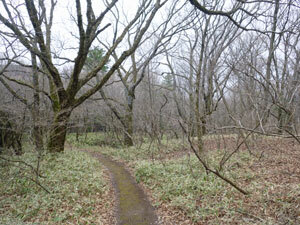 The track climbed steadily upwards beneath the leafless forest, silent apart from the occasional twitterings of forest birds, impatient for the return of spring. 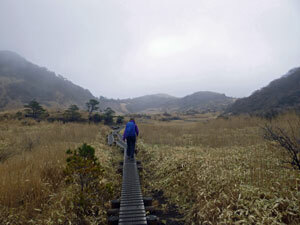 After a 300m climb we reached the saddle with misty views back over the straw-coloured Tadewara marshlands. 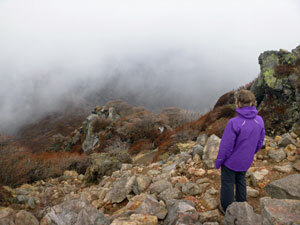 We were also reaching the cloud layer, as wisps of mist swirled around us. 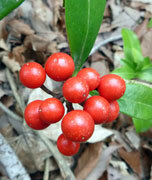 Pushing on, we crossed the flattish saddle to reach Ama-ga-ike, a small marshy grassland set in a hollow amongst the scrubby forest. 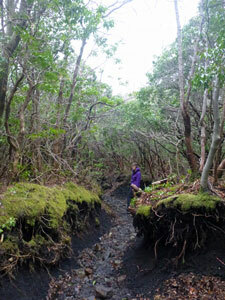 A section of boardwalk took us across the marsh and led us to the black muddy path of our descent into the next valley. 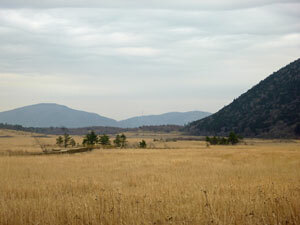 This was Bogatsuru, one of the biggest natural grasslands in the Kuju Mountains. 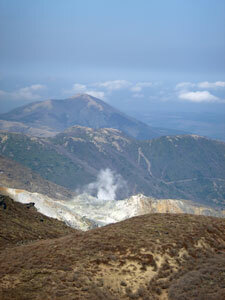 Looking across, its blackened surface was backed by the fog-shrouded cone of Taisen Volcano. 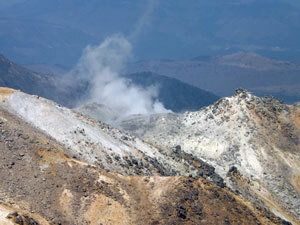 Bogatsuru is a region subject to the "noyaki", the traditional spring burning to regenerate the plants. It must have only happened recently, as the smell of burnt ash was still strong in the air as we walked past on our way to the hut. 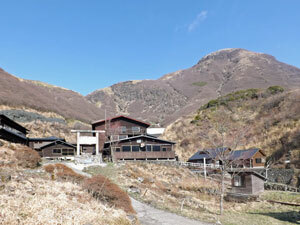 It was only a short climb from Bogatsuru up to the Hokke-in Mountain Hut, a large timber building sited beneath the steep slopes of one of Kuju's peaks, next to a sulphur-scented stream (it also has a hot spring - the highest in Kyushu). Checking in, we headed up to our room to enjoy a bite of lunch and watch the fog play hide and seek with Taisen. 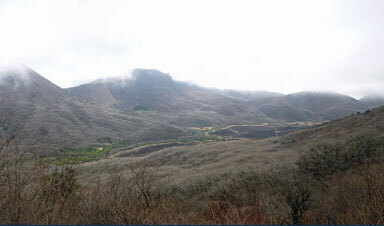 It had been our plan to climb up to the crater of this extinct volcano in the afternoon, but would it be worth it if the crater were shrouded in fog? What the heck - staying at the hut did not seem an option. 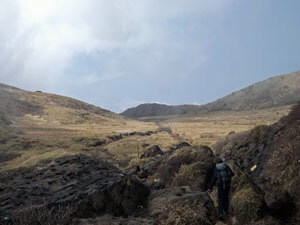 We set out, heading back to a camping area on the Bogatsuru meadow and, at a junction chose the path that headed directly up the volcano's slope. 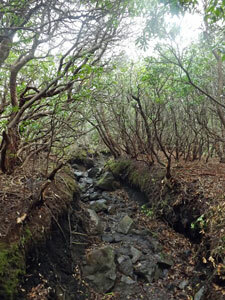 It was a bit of a scramble at times on a path that used basalt boulders as stepping stones and wound its way upwards beneath a scrubby canopy along erosion gullies in the loose volcanic soil. 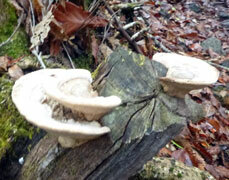 With the high humidity we were soon saturated. The odd showers passed by, but it didn't seem to matter whether we had our rain jackets on or not - wet from within or wet from without. 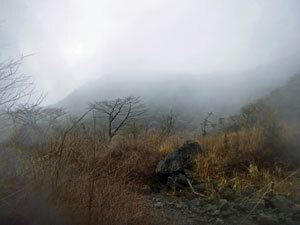 After 75 minutes of steady climbing, passing beneath an ever-shortening canopy of scrubby trees, we finally crested the volcano - in a dense fog! We were on the rim, but not the summit of Taisen, so dropping the packs, we made a bolt for the summit, at first pushing through the scrub on the narrow rim, then climbing and scrambling up towards the peak, across the odd remnant snowdrift and up large basalt boulders. 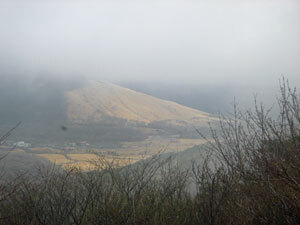 At times, gaps appeared in the fog, to give a sneak view of the valley below, or the crater within, or the shrouded summit ahead. 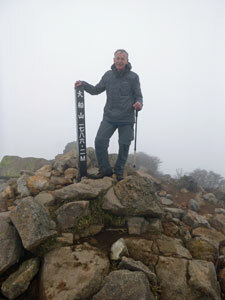 Finally we made it to the top of Taisen, stopped long enough in the cold wind and swirling mist of this exposed place to take a verifying photo, and beat a hasty retreat to pick up our packs. 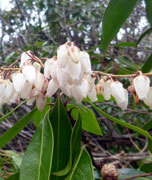 We decided on a different return route, taking a path eastwards along the crater rim - a narrow track through thickets of woody shrubs and low brown-tinged azaleas - too early for their magnificent blooms, too early for leaves even. The route eventually headed down, once again beneath a canopy of shrubby trees (which can pick your pockets as you pass - beware), using erosion gullies with black mud or loose basalt rocks as a path (kuju walking is certainly hard on the ankles). 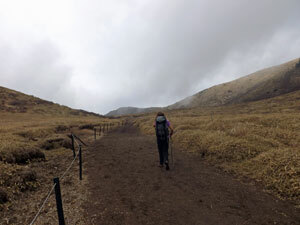 The track down led us to a saddle between Taisen and Hiji-dake, and from it the path took a more gentle line (though still with plenty of rocky steps and slippery slopes) to cross the lower slope of Taisen and regain the campsite at Bogatsuru. 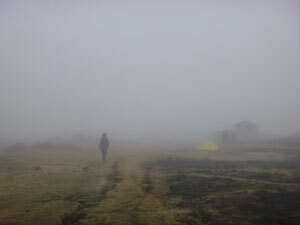 It had cleared for a while, but as we reached the campsite, a dense fog rolled across the grasslands enveloping all. Luckily we knew the way home from here and a short climb later, were back at the mountain hut just in time for dinner, followed by a long soak in the highest onsen in Kyushu. Our ankles had earned that much. Later that night, I looked out the window of our room to check out the weather. The moon looked right back at me - tomorrow promised to be a good day. The moon delivered on its promise - we awoke to not a cloud in the sky above us. 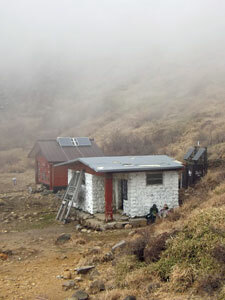 Keen to take advantage of the big blue, we bade farewell to our hosts at the mountain hut and set off. 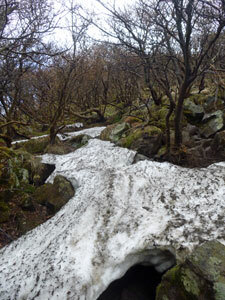 The track led us gently away from the hut up a long valley to a saddle between Taisen and the main block of the massif. From here we could see where all the clouds had gone - the low country to the west was hidden by a sea of white, with misty wisps already starting to stream up towards the pass. 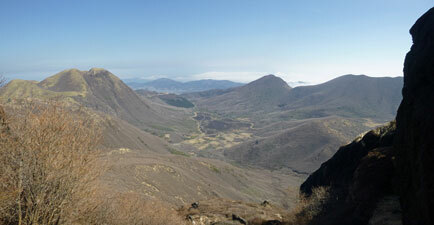 To our right lay the route to Nakadake, the highest peak in the massif and in all of Kyushu. 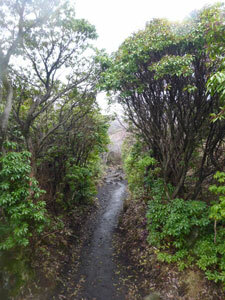 We looked at the path as it seemed to charge directly up the steep scrub-covered slope, shrugged our shoulders and set off. 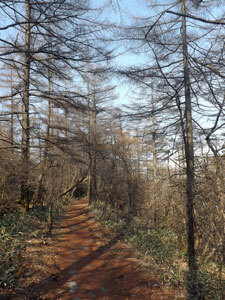 At first we struggled, as the black and red mud, slick from the rain of yesterday, gave little purchase for our boots. 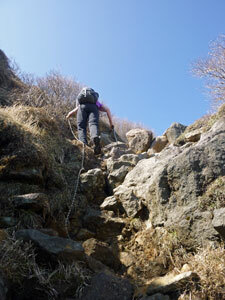 However, as we climbed, the track became more rocky and we pushed steadily upwards. 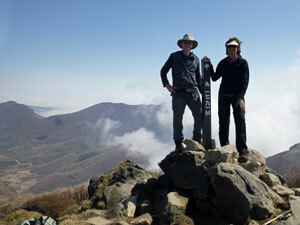 A final scramble over boulders brought us to the summit of 1720m Shirakudake and into the face of a cold wind. 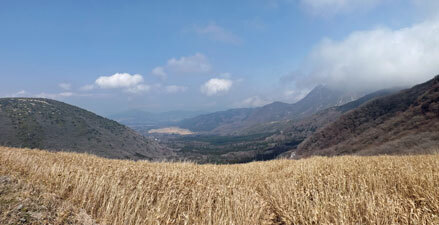 We donned our fleeces, as this was a great spot for a break to take in the glorious 360° views - back down over the valley of Bogatsuru, framed by the peaks of Mimata and Taisen (at last we know what it looks like), westwards over the sea of cloud, and north to the pyramidal form of neighbouring Nakadake and more distant, more rounded Kuju-san. Both peaks were on our list for the day. 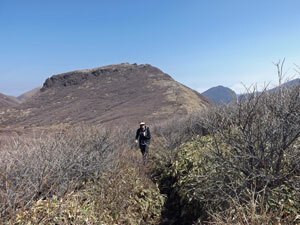 Firstly though we had to descend slightly to a saddle, before making a bee-line through the low bamboo groundcover and leafless head-high deciduous thickets, across a small plateau to the base of Nakadake. The climb itself was steep, but much easier than our initial ascent from the pass - firm rocks and even a small ladder and rope section to get around a tricky rock face brought us quickly to the summit, where the views over the Kuju massif were even more spectacular than from the last peak. 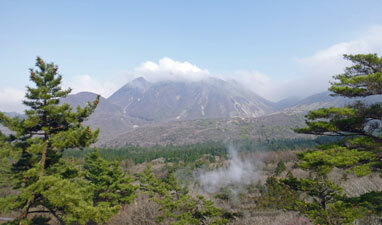 For the first time we could look down onto the smoking crater of Hossho-zan, the only active volcano in these mountains (it exploded in 1995 and has been smoking away ever since). 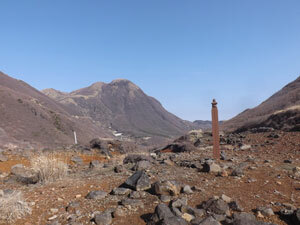 There was no-one higher than us in all of Kyushu and we gave ourselves a couple of chocolate biscuits as reward, while taking in the scenery. Part of the scenery now included waves of cloud billowing in through the passes and occasionally over the peaks themselves - the cloud to the west was clearly on the move, though tending to dissipate over the mountains. 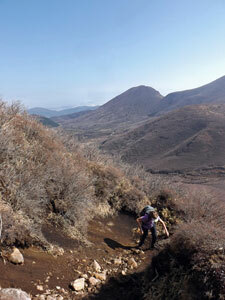 We thought it time to push on, descending the boulders on the north face of Nakadake to reach a narrow ridgeline. 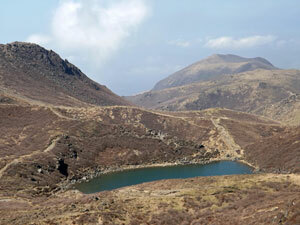 Below it lay a beautiful blue-green tarn, set in a volcanic hollow. 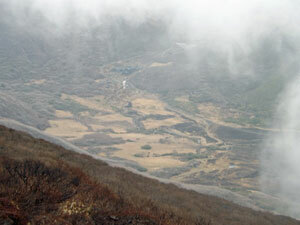 We descended to its shores and followed these around to a low saddle. 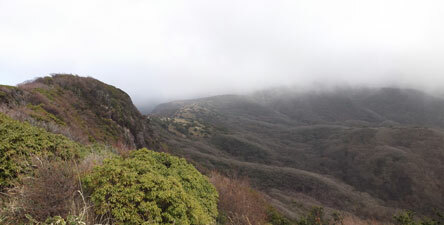 A narrow lip between a deep extinct crater on one side and a sloping drop towards the polychromic slopes of Hossho-zan's crater on the other brought us to the start of the climb up to Kuju-san (only 6m lower than Naka-dake, but a much gentler climb). 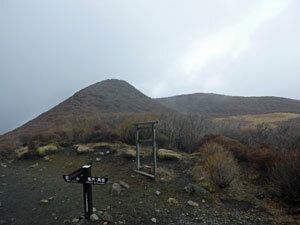 Here we joined the popular day route and as cloud swirled about, followed the small groups of day-walkers up to the summit. Finding a place out of the cold westerly wind, we stopped for lunch - a time to watch the play of cloud and mountain, as wispy ribbons of mist streamed up and over the western slopes above our heads or large billowing cloud pushed through the passes only to dissipate over the massif - a veritable game of hide and seek for the mountains around us. It seemed a good idea to head on - we quickly regained the junction below and turned north to head down the day-walkers route, following the yellow spots down a wide rocky slope to reach a small shelter hut. Climbing over a low rocky ridge, we crossed a broad grassland, The clouds seemed to be winning the day now, so we hurried on. 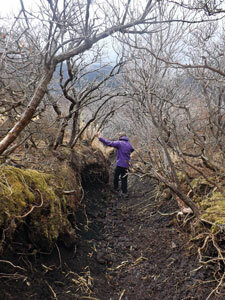 Fortunately, this popular track was well maintained and much smoother. 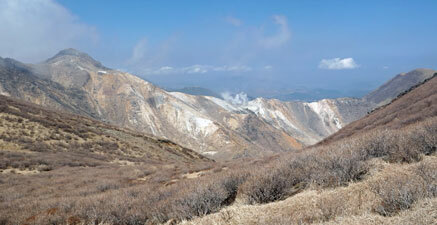 One last climb up onto a narrow razor back ridge brought us to the final descent to Makino-toge Pass. I had been dreading a steep and rocky descent, but this one was made for the masses - paved all the way down with steps where required. 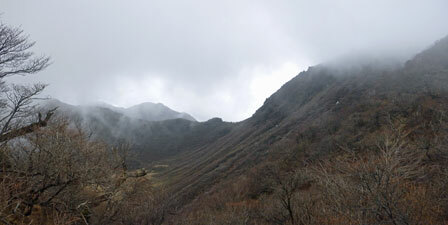 We were now at the car park and below the cloud (and next to a vending machine). 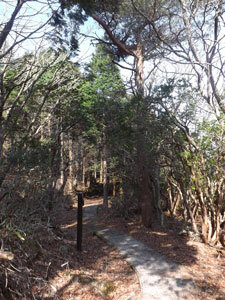 A lot of people finish at Makino-toge, but, after a bit of vending machine rehydration, we continued on downwards, following a paved track beneath the canopy of the deciduous forest. Downhill on a smooth track all the way to our hotel, with the birds singing softly in the trees - the best way to finish a walk in the Kuju Mountains. 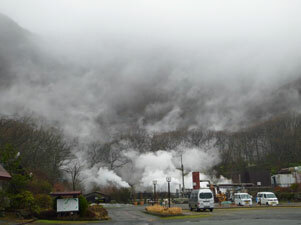 It was time for another onsen to soak our weary bodies (I fear that I am becoming addicted). 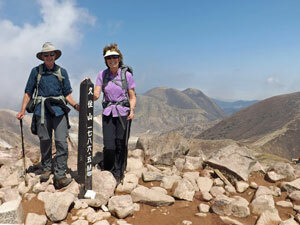 We are not peak-baggers, but I confess to a certain satisfaction in having climbed the three highest peaks in Kyushu on our Kuju circuit - with the bonus of having soaked in the highest onsen as well.